Bee pollen is a combination of pellets of plant pollen as well as nectar and the secretions from honeybees. 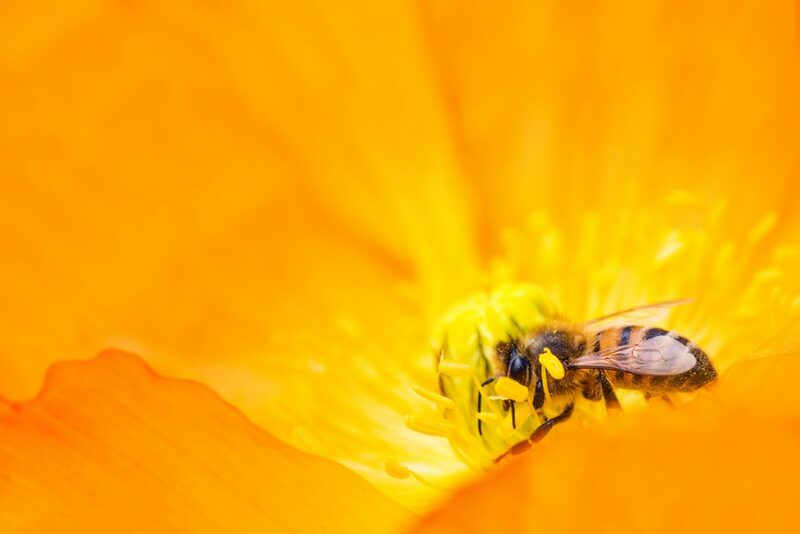 As bees go about collecting nectar from plants, pollen attaches itself to them. 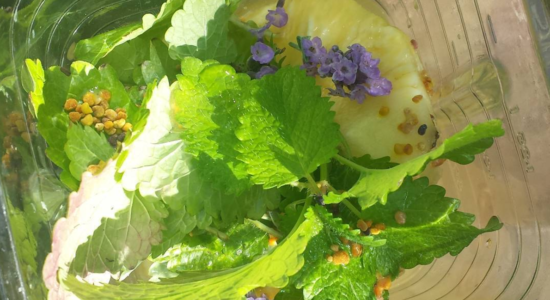 Pollen has been used by humans for centuries, has been present in folk medicine due to its amazing sources of bioactive substances and energy and today it is seen as a functional food – providing nourishment as well as numerous health benefits (Fernandes, P.A.R., et al., 2016). Regular consumption of bee pollen has been seen to benefit individuals with certain medical conditions, such as anemia, depression, poor memory, digestive issues, prostate problems, impotence, early ageing, adrenal fatigue and poor immune function (Llnskens, H.F., et al., 1997). Bee pollen is full of powerful antioxidants that positively benefit the body by preventing cellular oxidation and the formation of free radicals, as antioxidants are free-radical scavengers. When the body is overwhelmed by the presence of free radicals, cellular degeneration and an increase in cell death become more common, resulting in oxidative stress which further leads to the development of chronic and degenerative diseases. 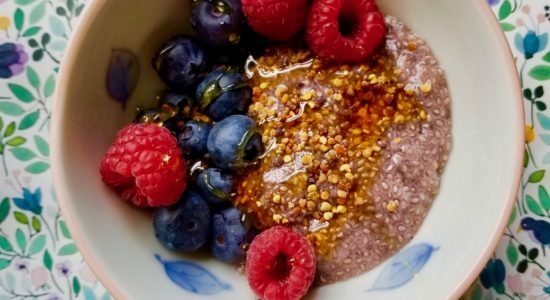 By including antioxidants, such as bee pollen in your diet on a daily basis you flood the body with these amazing free-radical fighters, not only do you boost your immune system, reduce inflammation, but you also reduce the risk of developing diseases (Campos, M.G.R., et al., 2010). Bee pollen has a desensitizing effect on the immune system, which is particularly beneficial for individuals who are allergic to pollens. By taking bee pollen, the immune system slowly gets exposed to small amount of pollen and slowly becomes desensitized to it. Over time pollen season becomes far more tolerable (Stengler, M, 2010). Bee pollen has a stimulating effect on bone formation. This is in part to the presence of an enzyme, alkaline phosphate, which partakes in bone mineralization. Taking bee pollen orally has been shown to increase calcium levels and strengthen bones, which is particularly beneficial for individuals with osteoarthritis (Campos, M.G.R., et al., 2010). Bee pollens, polyphenol content has been shown to promote heart health and ward off atherosclerotic plaque. Bee pollen aids in balancing cholesterol levels, reducing oxidative stress and inflammation, which are all beneficial for individuals who are at risk of coronary issues (Rzepecka-Stojko, A., et al., 2017). Poor diets negatively affect lipid management and can lead to an increase in total cholesterol levels and increase the risk of atherosclerosis. The polyphenol count in bee pollen has been shown to decrease total cholesterol levels in a 2017 study out of Poland. There may be several reasons for the stimulated decrease, one being an increase in cholesterol excretion with bile as well as far less cholesterol manufacturing by the liver. Naturally derived polyphenols -such as the ones found in bee pollen have a beneficial effect on being cardio and angio-protective as well as reducing the prevalence of hypercholesterolemia which can indicate the onset of atherosclerosis (Rzepecka-Stojko, A., et al., 2017). Lipofuscin is an age-pigment, brown-yellow in colour and present within the adrenals, liver, kidneys, the heart, the retina as well as nerve and ganglion cells. Lipofuscin accumulates in these organs and cells naturally as we age, but also at an increasing rate in the presence of oxidative stress from free radical damage. The greater their number the faster the ageing process accelerated, along with an earlier introduction of age-related disease (Terma, A., et al., 1990). Supplementation of bee pollen has shown to reduce lipofuscin within heart muscles as well as preventing its increase in the liver, brain and adrenal gland cells (Liu, X.L., et al., 1990). One of bee pollens hydrophobic compounds bring about an antimicrobial benefit, showing a positive effect against Viridans Streptococci. There is a regional variant for the antimicrobial effect that bee pollen has, for instance in Turkey bee pollen was found to be antibacterial against 13 distinct strains of bacteria (Campos, M.G.R., et al., 2010). 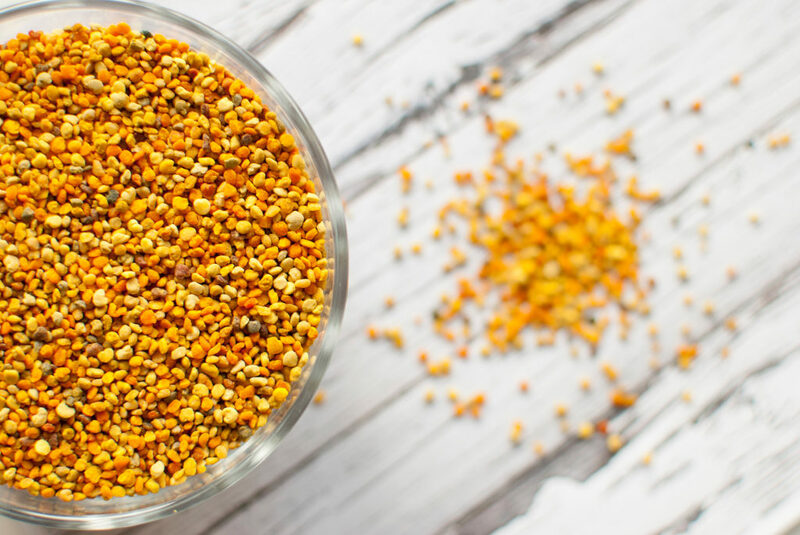 Bee pollen contains kaempferol, a substance that inhibits the activity of two specific enzymes, hyaluronidase and elastase, resulting in an increased strength of connective tissue and the sealing of blood vessels. Kaempferol has been shown to reduce pain and prevent the aggregation of platelets as well as reducing inflammatory swelling and improving circulation. Wounds often take even longer to heal when there is an underlining infection. Bee pollen, along with other bee products, has antimicrobial activities against bacteria that often affects post burn wounds (Komosinska-Vassev, K., et al., 2015). Bee Pollen includes a wide variety of nutrients, it is a functional superfood that is like natures multivitamin. It is plentiful in both vitamins and minerals as well as phenolic acid and flavonoids such as rutin and quercetin. Bee pollen contains silicon, molybdenum, boron, enzymes and sterols. 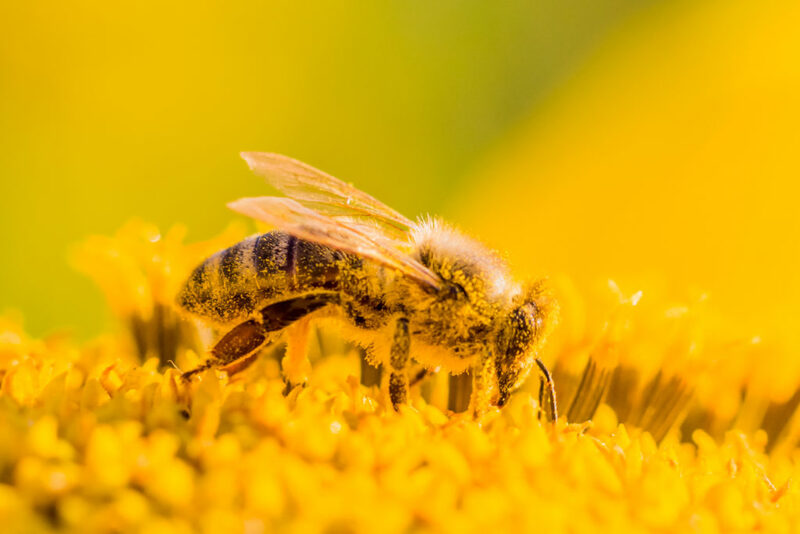 Each pollen has its own chemical specificity that is influenced by the plant species that produce the pollen and the type of bees that collect it (there is a distinction between wild and cultivating bee colonies) (Collin, S., et al., 1995). 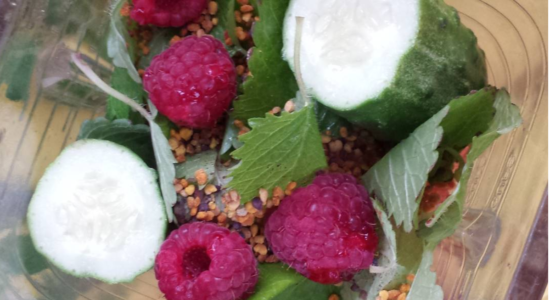 Phenolic phytochemicals are incredibly abundant in bee pollen. All plant life contains phenolic acids, it is present for protection against biological and environmental stressors, such as bacterial and fungal attacks (Vattem, D.A., et al., 2015). Phenolic compounds in bee pollen display abilities to scavenge free radicals, neutralize xenobiotics and reduce oxidative stress on organs (Fernandes, P.A.R., et al., 2016). Flavonoids provide plants with pigment, particularly vegetables and fruit. They are also integral to human health as they are proficient free radical scavengers, as well as being powerful antioxidants. Flavonoids strengthen our bodies protective enzyme system and provide cardiovascular protection, the reduction and prevention r old age-related diseases and cancer. Some flavonoids have even been linked to being potentially anti-HIV, however, more research needs to be done (Yao, L.H., et al., 2004). Rutin, a flavonoid, is sensitive to prolonged storage and heat, therefore bee products, such as pollen, that are abundant in it are an example of a high-quality product (Ranieri, A., et al., 2017). Bee pollen is made of about 15-30% water, therefore it required drying in order to be shelf stable and more nutrient dense. Not all drying processes are the same, just as pasteurized honey has far fewer benefits from raw honey so do the nutrients in bee pollen diminish if it is heated to a high temperature or simply dried for an extended period of time. What you want to look for is low-temperature drying for short periods of time. When pollen is dried at too high of a temperature the flavour profile changes as well, instead of having pollen that is sweet and aromatic you come upon pollen that has a high amount of dimethyl sulfide, or an unpleasant ‘cooked-onion’ flavour (Collin, S., et al., 1995). It is recommended to supplement with between 2-4 capsules of bee pollen daily for a therapeutic dosage. However, supplementing with 8 capsules daily, for a period of a week or a little more under can be effective for allergies, hay fever and head colds (Stengler, M., 2010). 2 capsules are equivalent to about 500-1000mg of bee pollen. Bee pollen is non-toxic therefore it is safe at higher dosages. Bee pollen allergies are very rare, though individuals who are allergic to bee stings should avoid bee pollen. It is always safe to test a small amount of bee pollen to make sure that you do not have any allergic reaction (this can be done by placing a small amount of powder on your tongue). Call your health care practitioner if you experience an allergic reaction, which can range from chest tightness, wheezing, hives, itching and rashes. (Stengler, M., 2010) (Fetrow, C., et al, 2000). Campos, M.G.R., Frigerio, C., Lopez, J., Bogdanov, S. (2010). 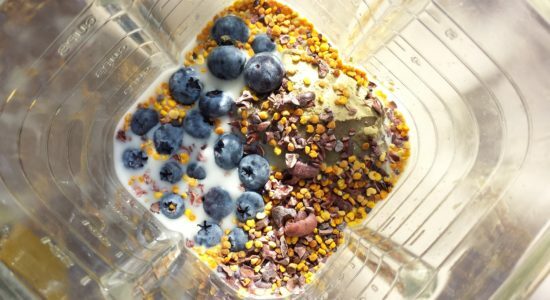 What is the future of Bee-Pollen? Journal of ApiProducts and ApiMedical Science. Volume 2, Issue 4, pages 131-144. Collin, S., Vanhavre, T., Bodart, E., Bouseta, A. (1995). Heat Treatment of Pollens: Impact on Their Volatile Flavor Constituents. Journal of Agriculture and Food Chemistry. Volume 43, pages 444-448. Fetrow, C.W, Avila, J.A. (2000). The Complete Guide to Herbal Medicines. Pocket Books; New York. Komosinska-Vassev, K., Olczyk, P., Kaźmierczak, J., Mencner, L., & Olczyk, K. (2015). 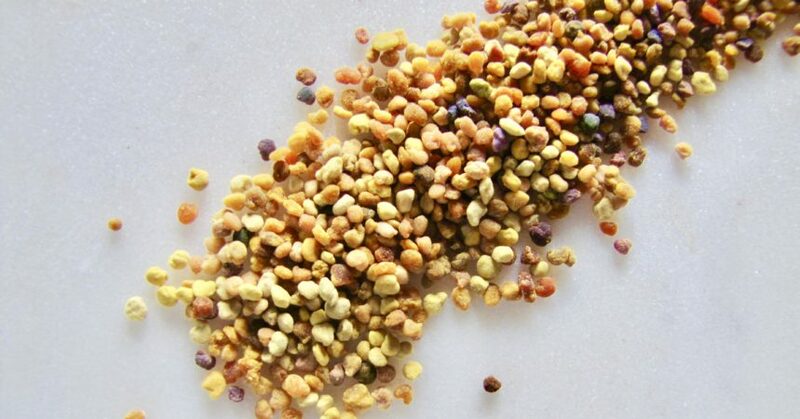 Bee pollen: chemical composition and therapeutic application. Evidence-based complementary and alternative medicine : eCAM, 2015, 297425. LIU, X L; LI, L M (1990) Morphological observation of effect of bee pollen on intercellular lipofuscin in NIH mice. J Chin Mater Med Zhongguo Zhongyao Zazhi 15: 561-563. Llnskens, H.F., Jorde, W. (1997). 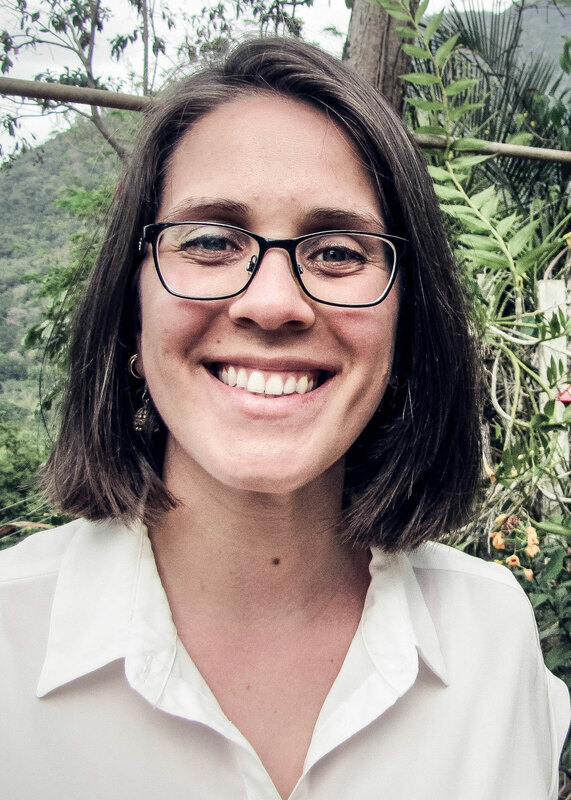 Pollen as food and medicine – A review. Economic Botany. Volume 57, Issue 78. Murray, M.T., Pizzorno, J. (2005). The Encyclopedia of Healing Foods. Atria Books; New York. Ranieri, A., Benelli, G., Castagna, A., Sherri, C., Signorini, F., Bientinesi, M, Nicolella, C., Canale, A. (2017). Freeze-drying duration influences the amino acid and rutein content in honeybee-collected chestnut pollen. Saudi Journal of Biological Sciences. Rzepecka-Stojko, A., Stojko, J., Jasik, K., Buszman, E. (2017). Anti-atherogenic Activity of Polyphenol-Rich Extract from Bee Pollen. Nutrients. Volume 9, Issue 12, page 1369. Stengler, M. (2010). The Natural Physician’s Healing Therapies: Proven Remedies Medical Doctors Don’t Know. Prentice Hall Press; Toronto. Terman, A., Brunk, U.T. (1990). Lipofuscin mechanisms of formation and increase with age. APMIS. Volume 106, Issue 2, pages 265-76. Vattem, D.A., Ghaedian, R., Shetty, K. (2015). Enhancing health Benefits of Berries hough phenolic antioxidant enrichment focus on cranberry. Asia Pacific Journal of Clinical Nutrition. Volume 14, issue 2, pages 120-130. Yao, L.H., Jiang, Y.m., Shi, J., Thomas-Barberan, F.A., Datta, N., Singanusong, R., Chen, S.S. (2004). Flavonoids in Food and Thier Health Benefits. Plant Foods for Human Nutrition. Volume 59, Issue, 3pages 113-122.